The L-808S Laser Infrared Illuminator from Pulsar is a tripod or Weaver rail-mountable lighting accessory for night vision devices. 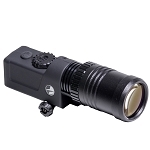 In addition to mounting this IR device to a Weaver rail, the illuminator comes with an adapter that allows it to be connected to any tripod with a 1/4"-20 mounting bolt. 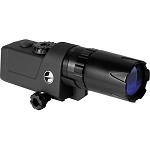 Windage and elevation dials allow the beam to be adjusted (horizontally and vertically) to align with the field of view of a night vision device.